Dan Rockwell writes some great blog posts on leadership. This one resonated with me this morning, and I thought I should repost it. Thank you, Dan! Poor management is the reason people inside organizations are in the fog. Impose the job of creating clarity on yourself. Stop complaining about people who don’t get it. 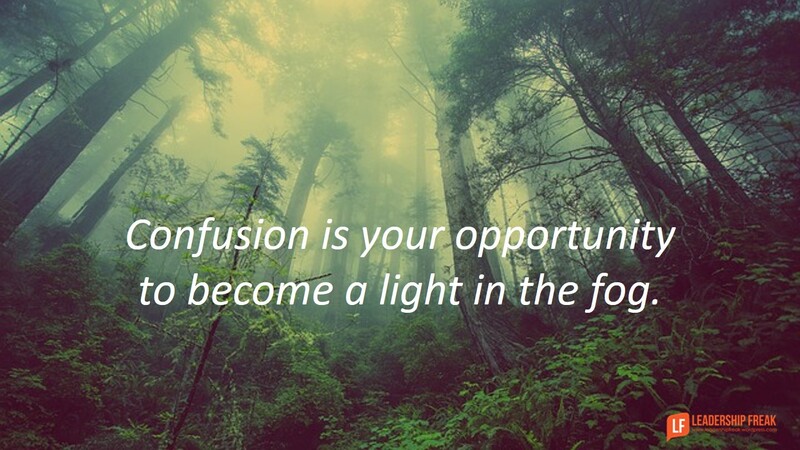 Confusion in others is your opportunity to become a light in the fog. Lean into confusion, not away from it. Confusion is your friend. Managers who embrace and then solve confusion move forward. Everyone else is lost in the fog, even if they’re working hard. Ron Wallace, former president of UPS International has a plan for lifting the fog. #1. State your expectations and then follow up. Describe the results you want. Explain the standards the results must meet. Relate any constraints (sacred cows to avoid). Establish the when and how of reporting progress. Outline how performance will be measured. Make yourself available to help. #2. Translate expectations into deliverables. #4. Check your own progress regularly. You find success by delivering results through relationships. How might leaders/managers create greater clarity?